As Pink Panther, you travel all around the world in order to look after the sons and daughters of top international politicians so that world peace remains. Things are getting even more complicated as an evil plot has been set and Pink Panther must beat some spies. You solve puzzles along the way and try to avoid traps while you find out many cultural aspects of life in the countries you travel. 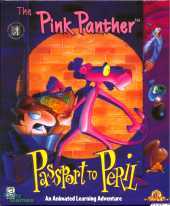 The game is a point and click adventure and it's mainly for kids : it's purpose is to bring them close to people,countries,religions and customs from all around the world : Pink Panther travels from Bombay to Cairo, Himalayas to London and beyond. Therefore the riddles are quite simple: Just collect an item and give it away,although there are some parts of the game that are very enjoyable and will attract kids even more : like the hide and seek game!.